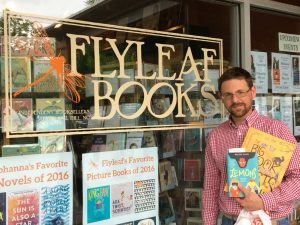 While on tour, I’ve been stopping into independent bookstores – lots of independent bookstores – not only to sign copies of Ginny Moon, but also to browse, and to pick out books for my kids. I fell in love with bookstores at a very early age. There was a bookstore in my hometown, Wallingford, Connecticut, called Library Hours. It was closed in the morning when I walked past it on the way to school, but after school it was open. I would go in, and browse through everything. At first I spent my allowance, but after I got a paper route (remember those?) I spent almost all my money there. My bedroom ended up full of books. Library Hours closed down long ago, sad to say. But for a long time, going to school was exciting because all day I could look forward to walking past the bookstore. So when I’m out doing readings, I like to stop by as many independent bookstores as I can. Here are some of my favorites! And some pictures, of course. Thanks for the shout out. Loved your book! Thanks so much for saying so, Lisa. 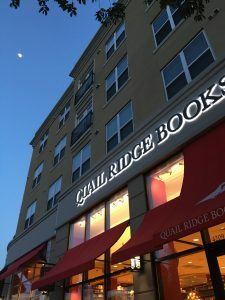 I look forward to returning to Quail Ridge Books next time I’m town! Loved Ginny Moon and the lessons within. I’ve worked with children with ASD for several years. Each and every one is different. We are still learning every day. Thank you for the insight of Ginny Moon. I believe it will make me a better friend to children and adults who live every day in a secret world.. I just finished reading your beautiful book, which was hand-sold to me at the indie bookstore in Pleasanton, CA, on the day you were appearing there. 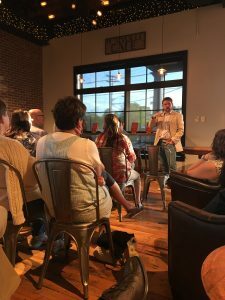 I couldn’t attend your reading–and I also missed you in Winnetka and Chicago, near where I live–but I’m so happy I was encouraged to buy Ginny Moon. What an exceptional and sympathetic person Ginny is. I am an adoptive mother and I saw myself in Maura at times. Thank goodness we had a Patrice in our lives who helped us stay intact as a family. Ginny and her family will stay in my heart. Hi Janet — So sorry I missed you in three locations! Very glad to hear that you enjoyed Ginny Moon, though. And that you appreciated Maura’s predicament. The support that adoptive parents receive from therapists and social workers, as well as from family and friends, is invaluable. My wife and I had an incredible support network when we adopted. It sounds like you had a similar experience. And yes, thank goodness for all the “Patrices” in our lives! Checked book out of library at 4:30pm, just finished reading at 12:45am. Oh so wonderful. Buying copies for my family. Thank you for this beautiful story. More please. Thanks, Diane! I’m hard at work on a second book, so if you’d like updates you can get them at http://benjaminludwig.com/mailing-list/! I am an 82 year old widow who loves to read. I usually get mysteries but checked out Ginny Moon because it was new at the library. It was beautiful and I could not put the book down. Loved it!!! Very much appreciate your kind words, Irene!